“I agree,” said Calvin Carrot. “I do as well,” said Olive Onion. “I propose that we take the afternoon off,” said Christopher. “Now that sounds like a plan,” said Mrs. Tomato. “I have prepared a feast for us,” said Christopher, pointing to a table he had setup in the corner room of the barn. “Look at all this wonderful food,” said Oliver Onion. “Everyone dig in,” said Christopher. “Thank you for this,” said Cameron Cauliflower. The Fresh Veggie Family enjoyed the feast Christopher had prepared for them. He had slices of ham, turkey and beef. He had cheese and freshly baked rolls. He had potato and macaroni salad too. “This food is so tasty,” said Calvin. “It sure is,” said Mrs. Tomato. They were enjoying the ice-cream too much to eat it slow. Each one of them had brain freeze. “I told you,” said Christopher. The Fresh Veggie family enjoyed their afternoon off. They were able to relax and get to know each other better. The next day at practice, they felt refreshed and they even sounded better than ever. “We need to do that more often,” said Christopher. The Fresh Veggie family agreed with him so, once a month they decided to have a feast together. It is always nice to take a break after working hard. Example: Christopher Corn felt that the band members needed to take a break after practicing so hard. 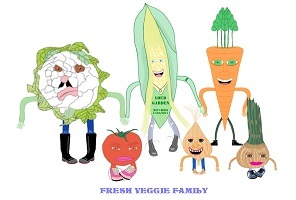 This entry was posted in Fresh Veggie Family Stories, Grade 4 Level, Summer Stories, Summer Story Challenge 2017 and tagged Christopher Corn, concert, Fresh Veggie Family, Fresh Veggie Family Summer Feast, garden, rain, relax, salad, summer feast. Bookmark the permalink.